‘Dreamings’ and dreaming narratives: what’s the relationship? 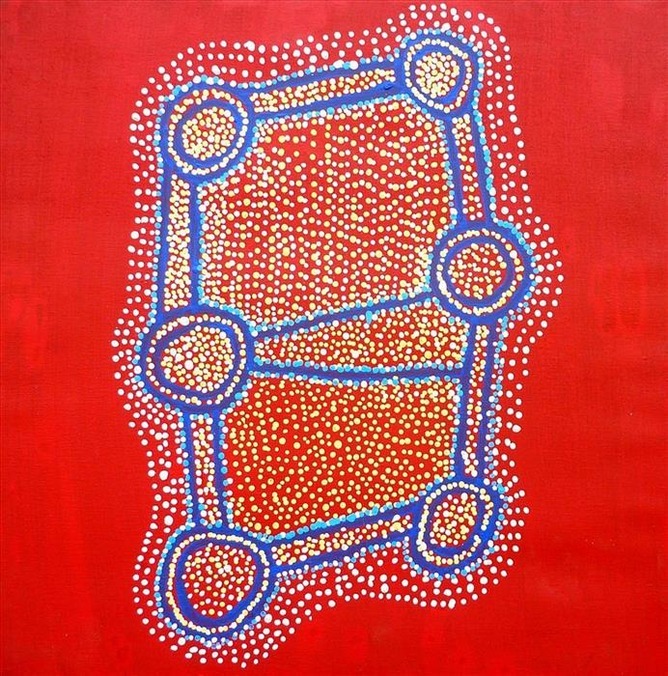 Shorty Jangala Robertson, 2011, Warlpiri, ‘Ngapa Jukurrpa’ (Water Dreaming) – Pirlinyanu, 76 x 76 cm. Copyright the artist; Warlukurlangu Artists, Yuendumu. To imagine what “Australia” was like B.C. (“Before Cook”, or before colonisation), one needs to envision the entire landmass of this island/continent and most of its surrounding islands and waters as crisscrossed by “Dreamings” (in popular parlance sometimes referred to as “Songlines”). Each of the approximately 250 separate Australian languages had their own words for and substantial vocabularies relating to what has now become known in English almost universally as “The Dreamtime” or “The Dreaming”. These usages have now entered other world languages as global tags for Indigenous Australian religion, thereby dramatically reducing outsiders’ capacity to grasp the diversity of Australian languages and cultures… Read More. This entry was posted in News, Research, Resources and tagged Aboriginal, art, Australia, Dreaming, Dreamtime, Georgraphy, Songlines, Spirituality. The term is over! What #EdResearch books or articles will you be reading during the break? Perhaps watching some compelling documentary film? Share on Twitter using the #EdResearch and tag us @UBCEdResearch for a chance to win one of the monthly draw prizes! Don’t forget to include a link so we can check it out, too. You can also post pictures of what it looks like to do research during the Holidays using #ThisIsResearch (don’t forget @UBCEdResearch to be entered in the draw). This entry was posted in Events, Research and tagged Education, Research, Social Media. This study seeks participation from early career teachers (years 1-5 of work experience) who work in a Metro Vancouver school. It aims to explore the experiences and practices of early career teachers who are participating/have participated in university-based coursework and/or extended professional development (PD) on the topic of Aboriginal/Indigenous education. This entry was posted in Research and tagged Identity, Indigenous Education, teachers.